Do you know the true cost of a workplace injury? Worker’s Compensation is just the tip of the iceberg! Every year, over 5 million workers are hurt on the job and file worker’s compensation claims. But did you know that worker’s comp is just the tip of the iceberg when it comes to the true costs of a workplace injury? 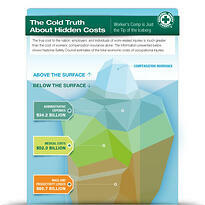 Learn the facts by downloading and sharing our free infographic, The Hidden Costs of Workplace Injuries.